Planning what to do with your kids this Easter? Come and join our huge Easter Egg hunts in Bounce & Beyond at 11am & 2pm from Good Friday 19th April to Easter Monday 22nd April. Yes, we are having it twice a day for four days due to popularity! 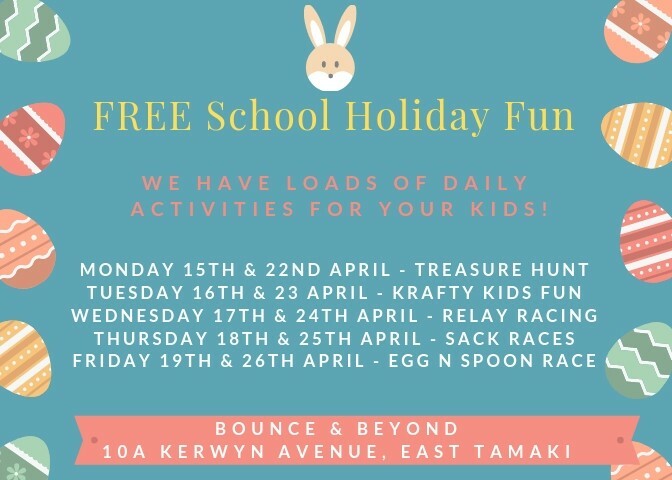 There will be heaps of Easter eggs, chocolate bunny and free family passes up for grabs, so hop on over to Bounce & Beyond this long weekend! Remember to Like our Facebook page, and do not miss out for a fun weekend with bounce houses, giant slide, obstacle course, horizontal bungee, and crafts! Bounce & Beyond is Auckland’s largest inflatable bounce centre dedicated to everyday fun. Our 1800 sqm facility features the coolest inflatables that will have you and your family jumping for joy! Also don't forget to check out our free School holiday daily activities on our facebook page!